Metro Vancouver visitors always talk about our trees – about how they make our city so green. With the Home Forest projects our trees will talk back. The project is a grassroots, data-driven way to understand and grow this invaluable asset. The root of Home Forest is an interactive, dynamic map of every single urban tree in our region, making it possible for each one to be treated as a contributing citizen. Home Forest will help urban residents to be stewards of their neighborhood trees, and help municipalities to track pests, diseases and plantings. The Home Forest concept has been proven in other leading cities such as Philadelphia and San Francisco as shown below, making it overdue for a Metro Vancouver adaptation. AUDIENCE: Residents and groups dedicated to the diversity, beauty and benefits of our urban forests. Home Forest aims to be a landmark of regional sustainability and a showcase for what can been achieved with a trusted data brokerage. The project is an important demonstration of participatory sensing and the value of citizen data streams. As with the complexity of a natural ecosystem, the broader benefits of Home Forest will be realized though concerted and serendipitous meshing of open and proprietary data streams in the Urban Opus Datahub. Urban trees have many proven benefits to community. Home Forest is way to employ citizen data to quantify and amplify those benefits, including for shade, air quality, stormwater runoff, property values, energy conservation, beautification and citizen wellbeing. Metro Vancouver currently has no way to appreciate the value of these benefits on their own, nor to leverage them against vital aspects of urban infrastructure and community development. While governments often have an inventory of the trees they manage, these data can be out of date, or inaccurate, and will not include information about trees planted by individuals or other organizations in the community. Open citizen engagement is the only feasible solution. Home Forest will use the Open Tree Map inventorying platform to enable individuals, organizations, and governments in the region to contribute collaboratively. Unlike other street trees project such as kitsTreeMap and Sense Tecnic’s Street Trees. Home Forest will unify government and crowdsourced tree information from Metro Vancouver municipalities, parks, individuals and organizations, making it available on the Urban Opus Datahub as well as an instance of Open Tree Maps platform for use by anyone interested in urban forests. Article about kitsTreeMap in BC Magazine and the kitsTreeMap site. 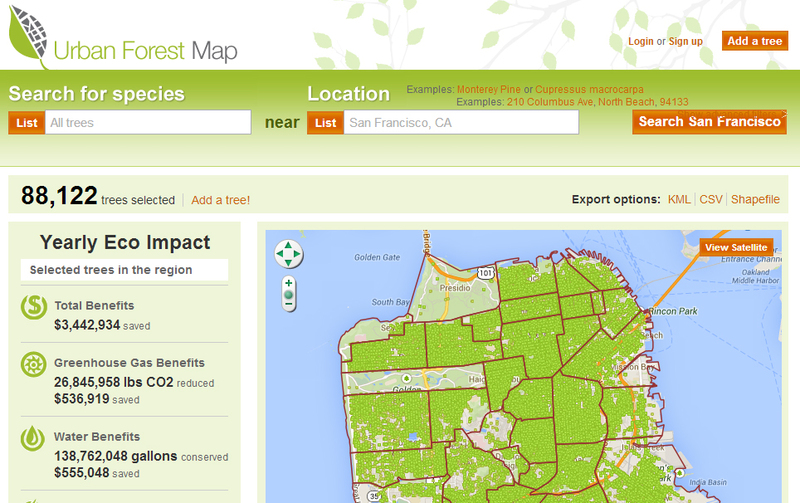 The OpenTreeMap cloud service for crowdsourced tree inventory, ecosystem services calculations, urban forestry analysis, and community engagement including links to projects and champions in other cities. Open Tree Map source code hosted on GitHub with links to projects and champions in other cities.